If you could design your own game controller or game, what would it look like? What games would you play? Come make a Makey Makey Game Controller or a Paper Plate Pachinko Game. Our makerspace will be conducted with the assistance of Alum Rock Art & Design Thinking Camp Youth Leaders. Explore making your own functioning unique game controller using a Makey Makey and playful materials like clay, pipe cleaners, straws, copper tape, buttons, paper clips, foil and more. Test your controller out on a Scratch game created by San Jose youth, or design a game yourself in Scratch. 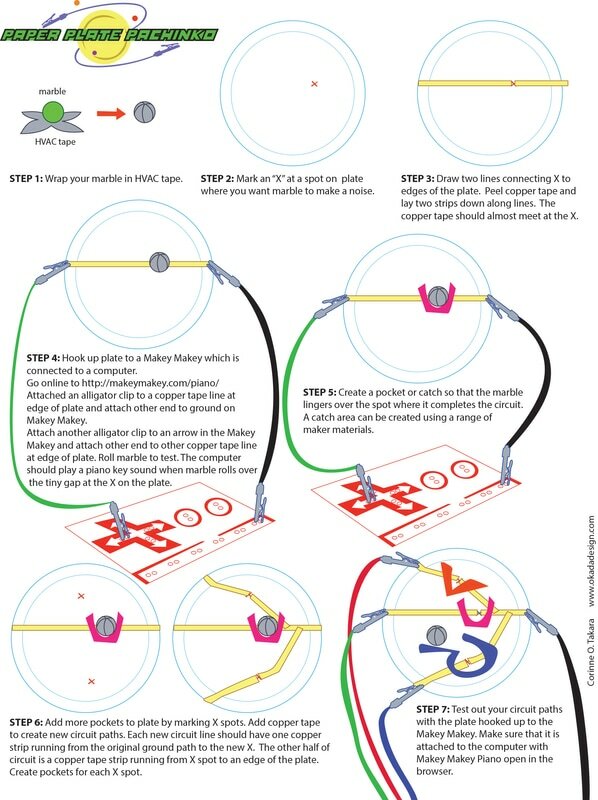 If you prefer to make a physical game, explore making a paper plate pachinko game that hooks up to a computer via a Makey Makey device. This project uses a conductive marble to complete open circuit paths as your roll it along the maze you create. Local Alum Rock youth will co-lead these projects as we build community through art/circuitry explorations at this pop-up makerspace.